This September we will be getting another sci-fi flick, as though we haven’t been indulged enough by then (Dredd, Prometheus and Total Recall). Here, we have the official international trailer for Looper which basically shows the same footage as the previous teasers and trailers but seems a little bit more polished. Unfortunately, Looper does seem to be a movie whose premise rests upon just one sci-fi device on which the entire plot is built upon, in this case a limited form of time-travel. Movies of such a type are rarely great and usually end up on the mediocre pile (Surrogates, The Adjustment Bureau, The 6th Day and I, Robot to just name a few). These movies try to appeal to viewers sympathies for about two hours before they out stay their welcome. I hope Looper will be different, but I fear it won’t. 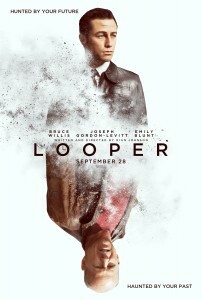 Looper stars Bruce Willis, Joseph Gordon-Levitt and Emily Blunt and is set for a September 28th release. The director is Rian Johnson who has absolutely no notable work in the science fiction genre whatsoever. Maybe he will surprise us then? Next story Total Recall gets a new trailer! Previous story Blade Runner 30 Year Anniversary!